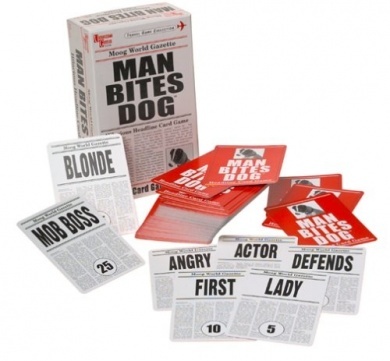 Published by University Games, Man Bites Dog is a card game about creating headlines—sensationalist headlines ripped from the front pages of newspapers such as The Sun and The National Enquirer. Designed for two to six players, aged eight and up, it consists of one-hundred-and-six cards, each with a word like 340 LB., Missing, Lobbyist, and Cruel. Each card is worth a certain number of points, for example, Wall St. (0), Tween (5), Hero (10), Tension (15), Loser (20), Falls For (25), Flirts with (30), and Priest (50). The players try to use these cards to construct creatively entertaining newspaper headlines that will score them points. If these headlines are an Exclusive—that is, the headline is played with an Exclusive card—then the headline is worth double points! At the start of each round, each player receives a hand of five cards and sees if he can create a headline. If does not think he can, then he can discard up to three cards and draw back up to five to try again. For example, Dave has drawn Lost (5), 1st Lady (25), Burns (10), Mystery (25), and TV (15). He could try with “1st Lady Burns TV Mystery”, but decides to discard Lost and draws Beauty (25). So he puts together “Mystery TV Beauty Burns 1st Lady”, which would be worth a total of 100! On her turn Louise draws Psychic (25), Secret (25), Strikes (10), Judge (25), and an Exclusive card. This is good hand of cards and Louise puts together “Psychic Strikes Secret Judge”, which would be worth 85 points, but because she has an Exclusive card, the total is doubled to 170! At the end of the round, the dealer collects up all of the cards—used and unused. The game proceeds like this until one person score five hundred or more points more. Physically, Man Bites Dog is reasonably presented. The cards show a good mix of words and phrases, and the rules are simple and easy to grasp, being presented on the one card. That said, its subject matter may mean it is not as suitable for younger players and for some families, the suggested minimum age of eight years old may be too low. Man Bites Dog is not a great game. It a very light and does not offer anything in the way of depth. It does call though, for some inventiveness and creativity upon the part of the players in constructing Headlines. This combination actually means that Man Bites Dog is a reasonable family game for teenage players and older who will probably appreciate the nuances of the genre. For the dedicated gamer, Man Bites Dog is probably too light to bear more than the very occasional play.